Cover photo courtesy of Gary L. Parr Why water flow is vital to corals Several decades of research has taught us that coral health is affected by many factors, including light, water quality, and water flow. The significance of water flow is recognized by both scientists and hobbyists alike, and our knowledge of how flow affects corals is ever increasing. At this time, it is clear that flow affects many processes in corals, including gas exchange, heat dissipation, bleaching sensitivity, nutrient supply, feeding, waste and sediment removal, growth and reproduction. Understanding the crucial role of water flow provides more insight into coral growth and benefits successful coral husbandry. Modern-day reef aquaria are reminiscent of intensive care units, equipped with sophisticated equipment such as state of the art lighting fixtures, efficient foam fractionators and powerful circulation pumps. 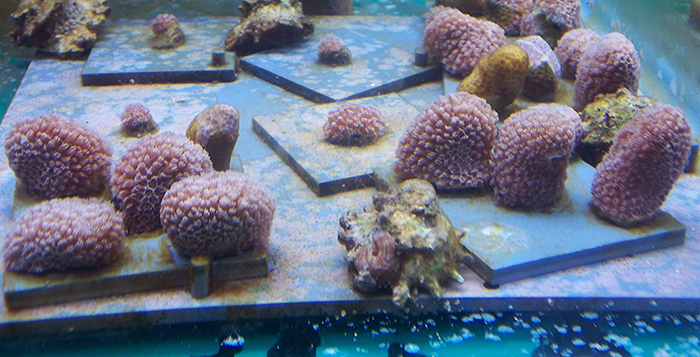 The importance of mimicking the natural reef environment with such technology is well understood by aquarists, resulting in healthy, fast growing corals. In this article, I would like to provide an overview of the mechanisms that underlie the positive effect of water flow on corals. Gas exchange One of the most important effects of water flow is that it greatly enhances gas exchange in coral tissue. Corals are animals with a relatively simple anatomy, having no complex organs such as lungs. Therefore, they rely on diffusion—the exchange of gases between the coral and the external environment—for respiration. Having a tissue layer that is only two cells thick—the ectoderm or skin, and gastroderm or gut lining—gases such as oxygen can easily enter the coral. For corals, taking up oxygen is vital at night. During the day, zooxanthellate corals have excess oxygen in their tissues, due to the zooxanthellae that produce oxygen by using (artificial) light. Therefore, these corals release oxygen during the day. Conversely, corals release carbon dioxide at night, a result of respiration, and absorb it during the day for photosynthesis. To maximize diffusion, many corals increase their surface area with pinnules, projections that rise from polyp tentacles. Despite this, however, the rate of oxygen or carbon dioxide diffusion, whether it is an influx or efflux, is greatly reduced in stagnant water. This is because of the so-called diffusive boundary layer, or DBL, that surrounds corals. 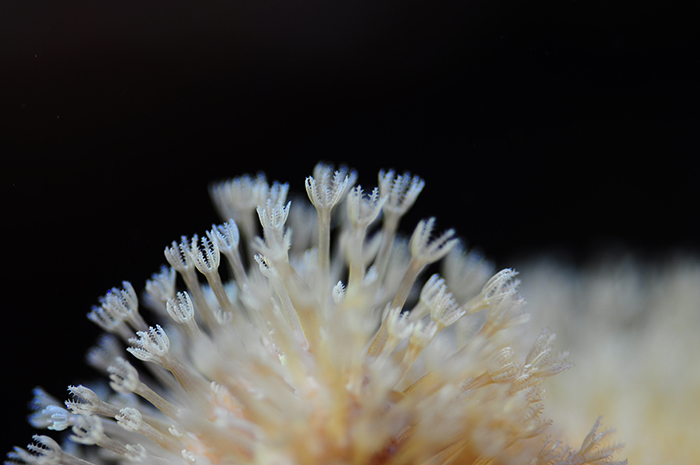 The polyps of octocorals (here Sarcophyton sp.) exhibit branched tentacles, which increase their surface area. This may facilitate gas exchange, nutrient uptake and waste removal. The DBL is a layer of relatively stagnant water that surrounds corals, and it is sometimes referred to as the tissue boundary layer. This stagnant layer is formed due to the friction between seawater and the coral, causing the water close to the coral surface to virtually stop flowing. It is in this boundary layer that gases such as oxygen can accumulate during the day, when the coral is trying to release it. The DBL can also become depleted of oxygen at night, when corals are actively respiring. For carbon dioxide, the opposite is true, with depletion in the DBL during the day, and accumulation at night. An accumulation or depletion of gases in the DBL will reduce diffusion rates, as diffusion requires a concentration gradient, or difference between the internal and external environment. This means that for a gas to enter the coral, the concentration of that gas should be higher in the external environment than in the coral’s tissue. For a gas to be effectively released, the concentration of that particular gas should be lower in the coral’s external environment than inside the coral. The higher the concentration gradient, or difference, between the external and internal environment, the higher the rate of diffusion. This relationship between the concentration gradient and diffusion rate was first described by Adolf Fick in 1855, and is known as Fick’s first law of diffusion. This law has important implications for coral physiology. For example, when oxygen accumulates in the DBL during the day, the efflux rate of oxygen is reduced as the concentration gradient between the coral tissue and seawater decreases, i.e. the oxygen concentration is high both inside and outside of the coral. Conversely, at night, a depletion of oxygen in the DBL will slow down the influx of oxygen into coral tissue, as the concentration gradient is also reduced, i.e. the oxygen concentration is low both inside and outside of the coral. Thus, the DBL can be regarded as a physical barrier that impedes diffusion. Here, the importance of water flow comes in. When water flow rate increases, the thickness of the DBL surrounding the coral decreases, as some of the friction between the coral and the seawater is overcome. Conversely, when water flow rate decreases, the thickness of the DBL increases. Thus, high water flow rates enhance diffusion by reducing the negative impact the DBL has on gas exchange. The figure below illustrates how water flow enhances diffusion by reducing DBL thickness: Above is a schematic drawing of how water flow enhances diffusion in corals, here an Acropora sp. The boundary layer is depicted in grey, oxygen molecules are represented by black spheres, a larger oxygen symbol indicates more oxygen in coral tissue, and higher diffusion rates are visualized by larger arrows. During the day, water flow reduces the width of the boundary layer, reducing the buildup of oxygen around the coral tissue, thereby increasing the oxygen concentration gradient between the coral and the surrounding seawater. This results in a higher efflux of oxygen to the water, thereby maintaining a stable tissue oxygen concentration. At night, water flow has a similar but opposite effect, reducing the depletion of oxygen in the boundary layer, enhancing the influx of oxygen by maintaining a high oxygen gradient. This again results in a stable tissue oxygen concentration. Indeed, research has shown that both respiration and photosynthesis are enhanced by water flow, concomitant with a reduced boundary layer thickness (Mass et al. 2010). As photosynthesis and respiration are vital to coral health, allowing the coral to produce energy to grow and reproduce, it logically follows that strong water flow can positively affect corals by enhancing the rates of these physiological processes. Therefore, high water flow rates often translate to increased coral growth (see below). Heat dissipation Next to enhancing gas exchange, water flow increases the exchange of energy between the coral and its surrounding environment. A recent study demonstrated that corals exhibit less tissue heating when water currents are increased (Jimenez et al. 2011). For this study, micro sensors were used to measure temperature variations at the surface of illuminated corals with an uneven surface (Leptastrea purpurea and Platygyra sinensis). The obtained data revealed millimeter-scale variations in the surface temperature of these species, including a so-called thermal boundary layer (TBL) with a higher temperature relative to the seawater. According to the researchers, the presence of a TBL could help understand the patchy nature of coral bleaching within single colonies. They also investigated the effect of water flow on the thermal microenvironment in hemispherical and branching corals (Porites lobata and Stylophora pistillata, respectively). For both coral species, the thickness of the TBL decreased significantly from 2.5 mm at low flow (0.3 cm s-1) to 1 mm at moderate flow (5 cm s-1). Although this decrease in TBL thickness by flow may seem marginal, the effects are striking, translating to a 0.1-0.5 degree Celsius reduction of coral surface warming. As zooxanthellae are highly sensitive to increases in ambient temperature, this could mean the difference between a bleached or non-bleached coral. Indeed, initial signs of bleaching have been observed in the inner parts of branching colonies (Rowan et al. 1997), where water flow is relatively weak. To summarize the first two sections of this article, we can state that enhanced gas exchange and heat dissipation at higher flow may reduce coral stress and bleaching sensitivity. This is likely the result of a more stable oxygen concentration and temperature of coral tissue at high water flow. Nutrient supply and feeding Water flow is also known to affect the supply of nutrients, which include dissolved inorganic matter (DIM; e.g. ammonium and phosphate), dissolved organic matter (DOM; e.g. amino acids) and particulate organic matter (POM), in the form of detritus and plankton. Many studies have investigated how water flow affects phyto- and zooplankton capture by corals, which include soft corals, gorgonians and stony corals (e.g. Dai and Lin 1993; Fabricius et al. 1995; Heidelberg et al. 1997; Helmuth and Sebens 1993; Hunter 1989; Lin et al. 2002; Sebens et al. 1997, 1998). 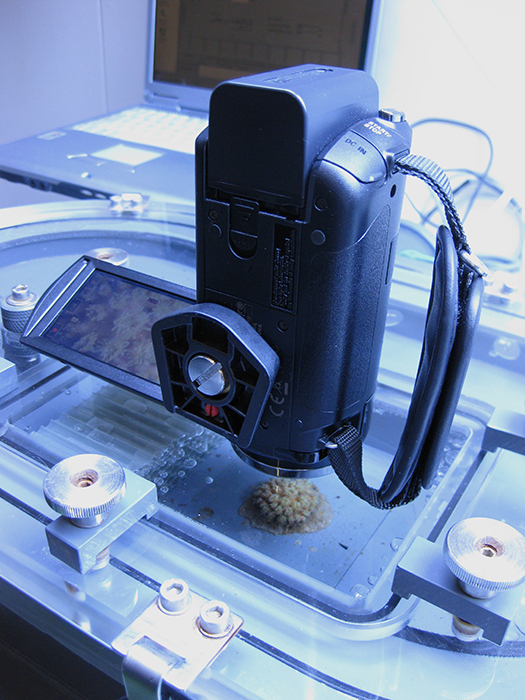 The effects of water flow on coral feeding can be studied using video cameras. 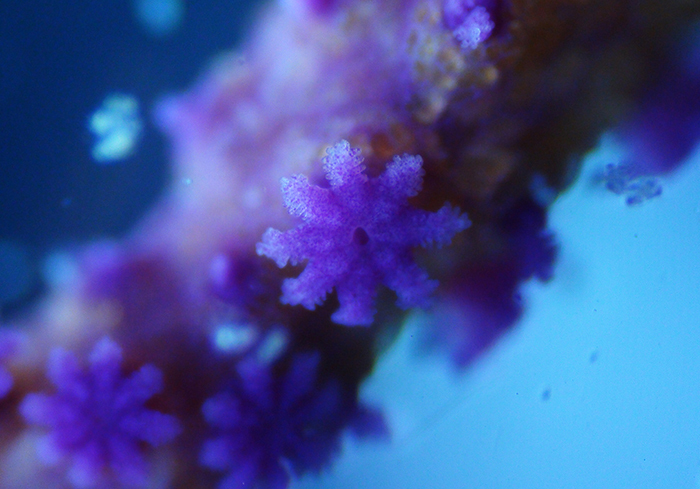 Recently, in our lab, we investigated the effects of water flow and colony size on the feeding rates of the scleractinian coral Galaxea fascicularis (Wijgerde et al. 2012). Our observations were consistent with many previous studies, and revealed that corals have a flow optimum at which they maximize prey capture. A general trend seems to be that at intermediate flow rates of 5 to 15 cm s-1, corals maximize particle capture. This is consistent with the average flow rates corals are exposed to in the wild, although locally, flow rates can be very low (e.g. lagoons) or high (e.g. reef crests). 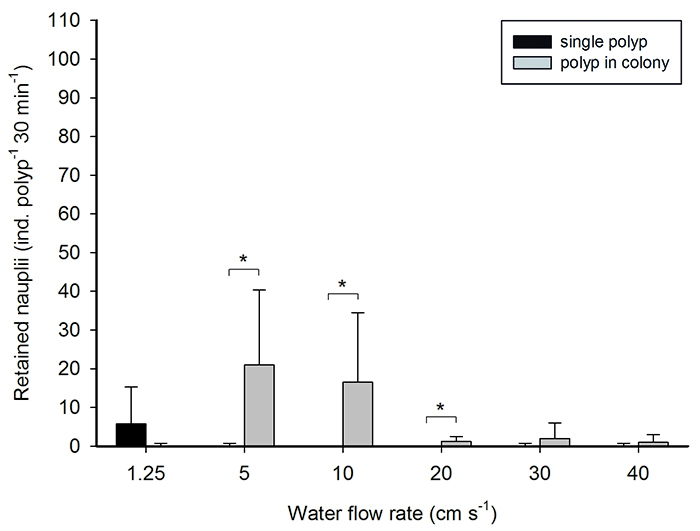 Solitary polyps can behave differently than colonies, however, with G. fascicularis polyps retaining most prey at very low flow rates of 1.25 cm s-1. This is possibly due to the fact that a single polyp is not shaded by surrounding, clonal polyps. The effect of water flow rate on prey retention by Galaxea fascicularis polyps. 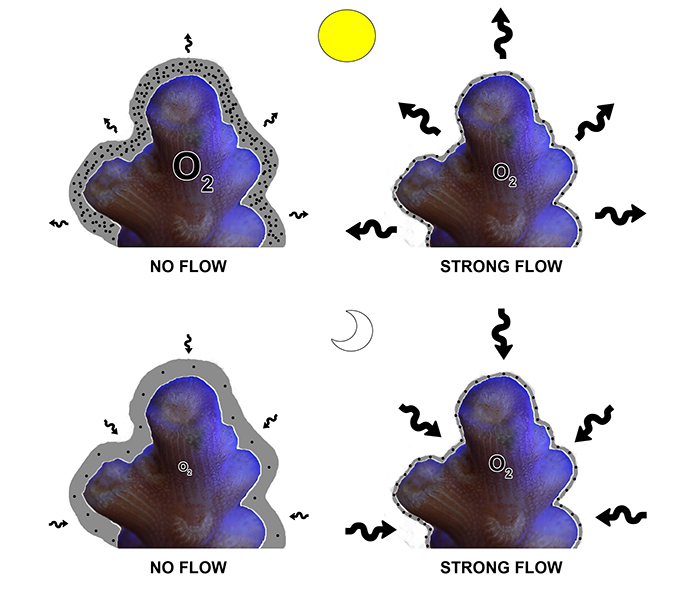 Polyps in colonies retain more prey than solitary individuals at intermediate flow rates, whereas solitary polyps retain most prey at a low flow rate. 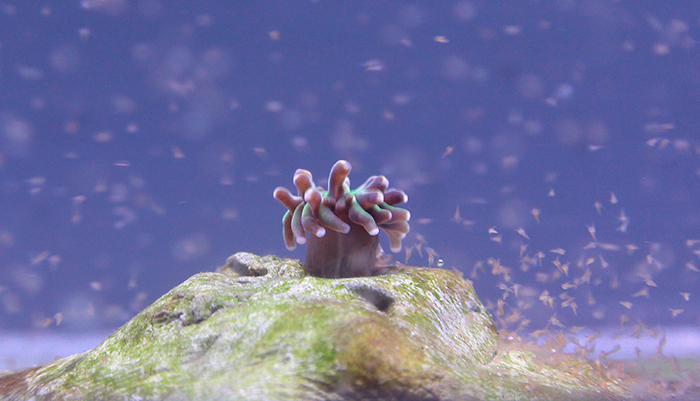 Knowledge of how flow affects coral feeding is relevant to aquaculture and the aquarium hobby, as nutrient uptake and plankton feeding are essential to coral growth (reviewed by Houlbrèque and Ferrier-Pagès 2009; Osinga et al. 2011). A flow meter will help the aquarist optimize local flow regimes in the aquarium to maximize feed intake and growth. Polyps of the scleractinian coral Galaxea fascicularis seem to feed optimally at low and moderate flow rates of 1.25 to 10 cm s-1. Note the eddy that has formed on the leeward side of the polyp, in which Artemia nauplii accumulate. Photograph by Pascal Spijkers. The microscopic pinnules on the tentacles of these gorgonian polyps may be used to filter pico- and nanoplankton from the flowing water, including bacteria, algae and protozoa. Waste and sediment removal Next to nutrient and food supply, the removal of waste is important to coral health. Corals are known to secrete metabolic waste products, including DOM and mucus (Ferrier-Pagés et al. 1998; Bythell and Wild 2011), the removal of which can be enhanced by water flow. For example, the Caribbean species Porites porites secretes copious amounts of mucus at a regular interval (approximately 2 weeks), which forms a thick mucus tunic that envelops entire colonies. These tunics are quickly colonized by bacteria or algae, and retain sediment. When this happens, either in the field or in the aquarium, Porites porites corals appear sickly or dead. However, after several days, the tunics are released and swept away by the water current, after which healthy polyps emerge. Without sufficient water flow, these corals would certainly perish. Next to enhancing mucus removal, flow also facilitates the removal of sediment from coral surfaces. Sediment is everything which settles on the coral, including sand and detritus, and can suffocate entire colonies when sedimentation rates are high and/or water flow is too low. When corals are exposed to high sediment loads, tissue necrosis and death will ensue. The amount of sediment and the duration of exposure will affect corals in different ways, depending on species (reviewed by Erftemeijer et al. 2012). Corals from the Fungiidae family seem to be an exception, however. Recently, Bongaerts et al. (2012) found that the corals Lobactis scutariaand Herpolitha limax are able to overcome live burial by what they call “pulsed inflation”. By inflating themselves with water, and using their tentacles during deflation, these corals can excavate themselves within several hours. This unique capability reflects the niche these corals occupy in the wild, where they live freely on reef sands that can bury them during storms. Despite this capability, water flow remains an important means to remove excess sediment from coral tissue. These Caribbean Porites porites produce a thick mucus tunic in regular intervals, which gets covered in sediment, bacteria and algae (specimens to the left and right of the middle). After several days, this tunic is removed by water currents, after which healthy polyps extend again. Growth It is clear that water flow affects coral physiology in numerous ways, which translates to enhanced coral growth, especially under high light regimes. Two recent studies by Schutter et al. (2010, 2011) revealed that water flow rate is positively correlated to coral growth, and that water flow enhances the effect of light on growth. For their first study, they cultured G. fascicularis colonies under flow rates ranging from 0 to 25 cm s-1. Buoyant weight, surface area, and polyp number were measured at regular intervals. At the highest flow regime of 25 cm s-1, they found highest increases in growth. They theorized that higher flow rates reduce the competition between corals, algae and cyanobacteria, favoring coral growth. They also stated that increased respiration and (in)organic nutrient uptake might have been equally responsible for increased growth at the highest flow regime. During the second study, they exposed the same species to an intermediate (PAR of 300 μE m-2 s-1) and high light intensity (600 μE m-2 s-1), at either moderate (5-10 cm s-1) or high (15-25 cm s-1) water flow. They found that light intensity and water flow rate act synergistically, as the combination of strong light and flow resulted in a dramatic enhancement of coral growth. The effect of light at high flow was 2-3 times higher compared to its effect under low flow. The fact that light has a much stronger effect on coral growth at high water flow is, according to the marine biologists, likely the result of enhanced photosynthesis and reduced oxygen stress. A relief of oxygen stress is important, as high tissue oxygen concentrations are toxic to animals. 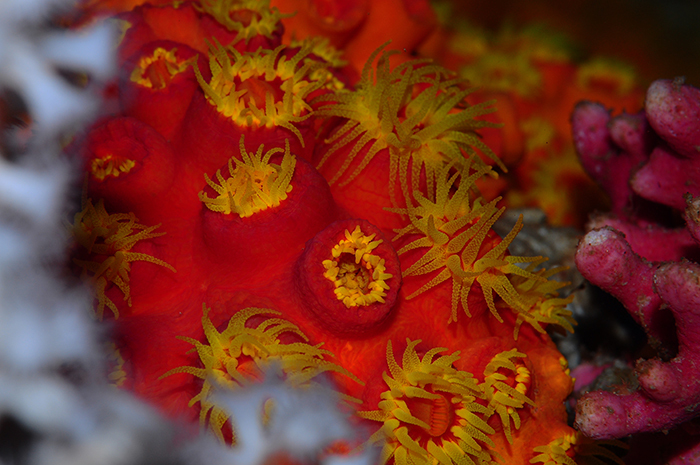 As it is common practice to provide aquarium corals with strong illumination, the capacity of circulation pumps should match those of the lighting fixtures used. Final remarks The mechanisms discussed in this article underscore the vital role of water flow in the wellbeing of corals, although its effects extend beyond those described here. For example, water currents are essential to sexual coral reproduction, as they carry coral gametes and larvae from one reef to another. The take-home message is that coral growth and health are affected by a complex interaction of factors, of which water flow is a crucial one. Aquarists can use this insight as an incentive to optimize water flow in their aquaria, which will benefit the health of the corals they are trying to grow. Tubastrea spp. seem to benefit from strong water currents.